This little jumper gave me just enough time to snap a couple photos before he jumped out of the frame.This was the smallest magnolia green jumper I have come across. I didn’t expect a worthwhile shot because I wasn’t using my extension tubes at the time, but am pleased with this effort. In Florida and other southeastern states, the Magnolia Green Jumper is one of the most easily recognized of all the jumping spiders. Its vibrant green coloring along with that stupendously orange cap and huge, forward-looking eyes give it an eerily cute appearance. But have no doubt, this little spider is a balls-to-the-wall predator, easily hunting and capturing prey many times its own size. 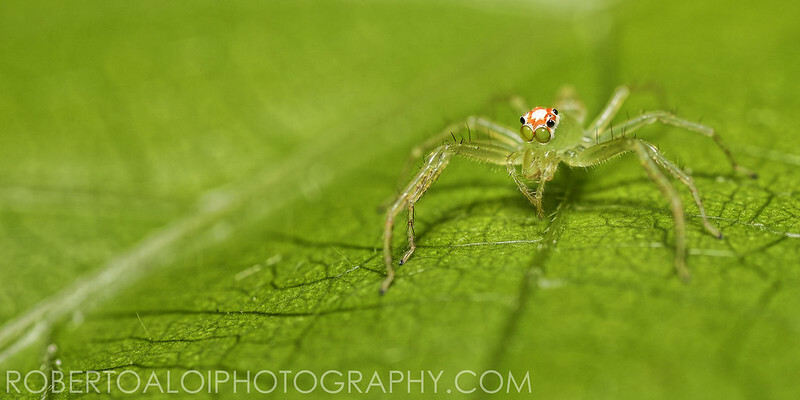 Jumping spiders are small to medium in size, stout-bodied and short-legged, with a distinctive eye pattern. The body is rather hairy (pubescent) and frequently brightly colored or iridescent. Some species are ant like in appearance. The jumping spiders forage for their prey in the daytime. They approach prey slowly and, when a short distance away, make a sudden leap onto the unfortunate animal. They are good jumpers and can leap many times their own body length. Jumping spiders have excellent vision, with among the highest acuities in invertebrates. The eight eyes are grouped four on the face (the two big Anterior Median eyes in the middle, and two smaller Anterior Lateral eyes to the side), and four on top of the carapace (two medium-sized eyes toward the back, and two very small eyes in front of them). You can think of the Anterior Median eyes (AME) as acting like our fovea, with high acuity but small field of view, and the remaining six eyes acting like our peripheral vision, with lower resolution but broad field of view. The AME’s are long and tubular, which helps their resolution (longer focal length, more magnification) but which means they have a narrow field of view. Since the AME’s have a narrow field of view, the spider needs to point them in different directions to see different things. To some extent this is done by moving the carapace, but the eyes can move as well. This is not done by moving the whole ‘eyeball’, since the lenses of the eyes are actually built into the carapace. Instead the retina moves around, while the lens stays fixed. This retinal movement is accomplished by extremely tiny muscles.